Heads up. Tomorrow 8am eastern on SPEED is Jerez MotoGP. Moto2 is later in the day. Sounds like a crash fest so far. Hey, where are you seeing this? Speed 2? WTH? Cal crashed twice and qualified 4th! Dani, Marc and Rossi all had offs. Looking forward to seeing the race. Marquez is absolutely driving the wheels off that thing to try and pass Loren-toe!! He is riding it to the ragged edge. I think Lorenzo is about to give up fending him off. But can anyone catch Pedroza? Ok, I'm not a George fan but that was a bit dirty! 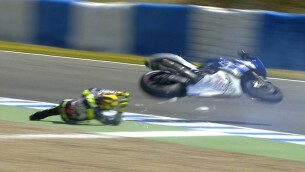 In the words of Jimmie Weinert "Lovely, let's bump", I've seen Rossi do worse! That was a little naughty, but what a great race.